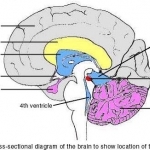 The pineal gland is a tiny structure located at the back of the roof of the third ventricle of the brain. (The ventricles are parts of the brain filled with cerebrospinal fluid (CSF), which acts to maintain the optimum chemical environment for the central nervous system cells). It lies very near the midline of the brain. Indeed, the pineal becomes steadily calcified with age meaning it shows up clearly on skull X-rays and CT scans to allow identification of the midline. Glial cells - these are the interstitial cells that bulk out the gland, giving it form. The arterial blood supply comes from the posterior choroidal artery, a small artery that feeds the pineal and other nearby structures that secrete the CSF into the ventricular system. The venous drainage is by the internal cerebral veins, a network of veins within the brain that drain many regions. In the adult, the pineal gland receives an indirect neural input from the eyes, important in its role as part of the internal body clock in man, described in the section 'What does the pineal gland do?' Nerves from the retina pass to an area called the suprachiasmatic nucleus (SCN), again an important anatomical area involved in the body's internal clock. Nerves from the SCN then go down into part of the brainstem, down into the spinal cord in the neck region until they reach a group of nerves called the superior cervical ganglion. Further upward connections then go to the pineal gland, using noradrenergic neurones (nerves that use noradrenaline as the neurotransmitter).